In February 2012, a salvage excavation was conducted in the middle of Kafr Misr (Permit No. A-6406; map ref. 239968–40003/727907–42), after ancient remains were discovered in a probe trench dug by a backhoe. The excavation, on behalf of the Israel Antiquities Authority, was directed by A. Hilman (photography), with the assistance of Y. Lavan (administration), R. Mishayev (surveying and drafting), N. Getzov (ceramic consultation), L. Porat (pottery restoration) and H. Tahan-Rosen (pottery drawing). Two excavation squares (B2, B3; Figs. 1, 2) were opened c. 250 m apart from each other, northeast of the village mosque. 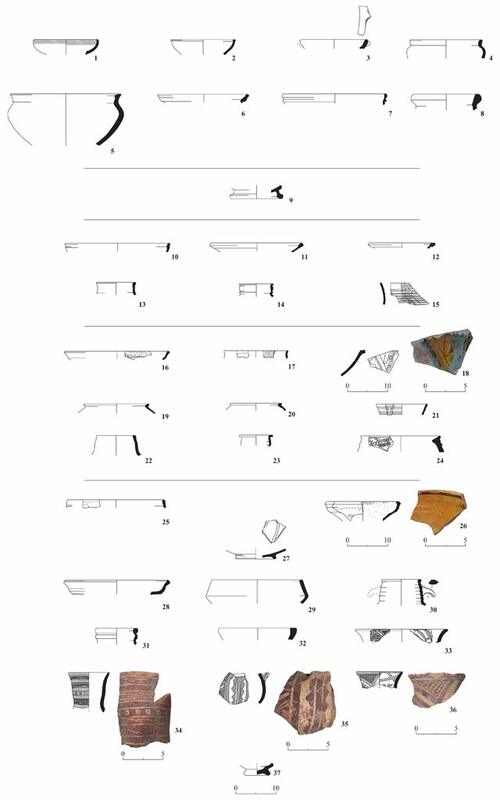 Poorly preserved architectural remains from the Iron Age I (Stratum III) and Mamluk period (Stratum I) were discovered, as well as accumulations of soil and pottery sherds from various periods (Stratum II). The surface layer (depth 0.3 m) was removed by means of a bulldozer and the excavation did not reach virgin soil. Several excavations were previously conducted at Kafr Misr, in which architectural remains and pottery sherds ranging in date from the Hellenistic period to the Mamluk period were discovered (Onn 1994; Syon 2006). Stratum III. A plaster floor (L106; Fig. 3) and an elliptical plaster installation (L108; 0.7 × 0.9 m, preserved height c. 0.3 m; Fig. 4) were discovered in Sq B2, c. 2 m below the surface. An accumulation of earth and numerous pottery sherds (thickness c. 0.3 m) dating to the Early Iron Age was discovered on the floor. A burnt layer (thickness c. 3 cm) was unearthed above the accumulation; not enough finds were discovered in this layer to date it. The remains of this stratum were damaged when a cesspit was constructed in the Mamluk period (below, L104). A similar accumulation of soil and many pottery sherds, dating to the beginning of the Iron Age (L105), was exposed in Sq B3. The numerous sherds in the accumulations included bowls (Fig. 5:1–3), kraters (Fig. 5:4, 5), cooking pots (Fig. 5:6, 7) and a pithos (Fig. 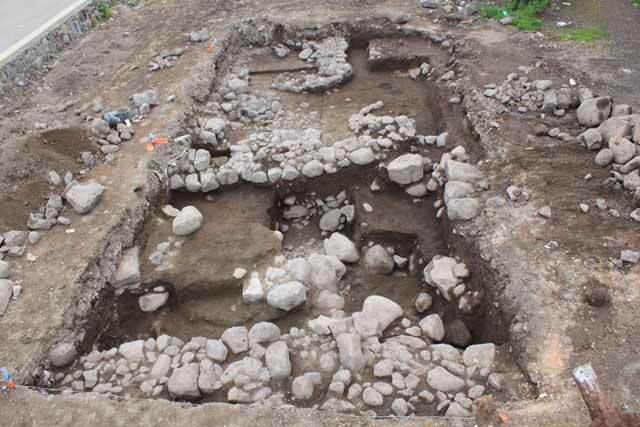 5:8) dating to the Early Iron Age. Stratum II. Accumulations of soil with large amounts of pottery sherds postdating the Iron Age and earlier than the Mamluk period were exposed. These included a mortarium base from the Persian period (Fig. 5:9), bowl from the Late Roman or Early Byzantine period (Fig. 5:10), imported bowls from Phocaea, western Anatolia (Fig. 5:11, 12), typical Galilean jars (Fig. 5:13–15) dating to the Byzantine period, as well as polychrome glazed bowls (Fig. 5:16–18), thin-walled cooking pots (Fig. 5:19, 20), a jug made of well-levigated buff ware (Fig. 5:21), a jar with a tall rim (Fig. 5:22), a table amphora (Fig. 5:23) and a pithos (Fig. 5:24) dating to the Early Islamic period. Stratum I. Remains of two walls (W200, W203) built of dry construction utilizing different-size fieldstones were discovered on the remains of Stratum III. They were aligned in a general north–south direction and were preserved two courses high. The two walls apparently belonged to two buildings separated by a common courtyard. A cesspit (L104; diam. c 0.7 m) and a tabun (L101; diam. 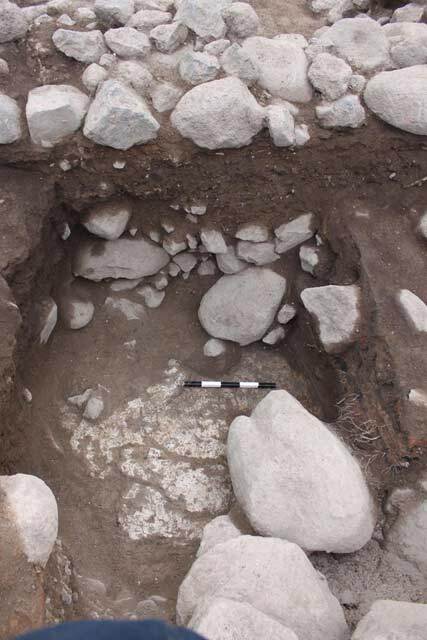 c. 0.5 m) were discovered in the courtyard. The cesspit was wider at its bottom, where the walls were lined with large fieldstones; the lining stones became increasingly smaller toward the top. Remains of a round, partially preserved installation (L109; Fig. 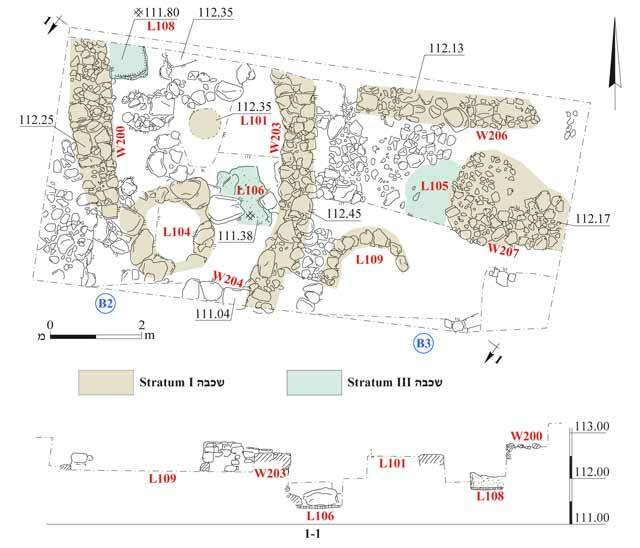 6) constructed of small fieldstones were discovered east of W203.In the northern part of Sq B3 were meager remains of a wall (W206) built along an east–west axis. Wall 206 might have adjoined W203 in the past. A surface of medium-sized fieldstones (W207), either the remains of a wall or a floor foundation, was discovered in the eastern part of Sq B3. In the southern part of the square, a small section of another wall (W204) was found at a slightly higher level than the rest of the walls in the stratum. Consequently, it is unclear whether Wall 204 belongs to this stratum or is of a later date. Soil accumulations mixed with numerous pottery sherds from the Mamluk period were discovered between the walls and installations. Among the vessels represented are glazed bowls (Fig. 5:25–27), a yellowish-brown glazed frying pan (Fig. 5:28), a handmade cooking pot (Fig. 5:29), jars (Fig. 5:30, 31) and many handmade vessels made of clay containing straw temper that often bear a light-color slip and are decorated with brown and red geometric patterns (Fig. 5:32–37). 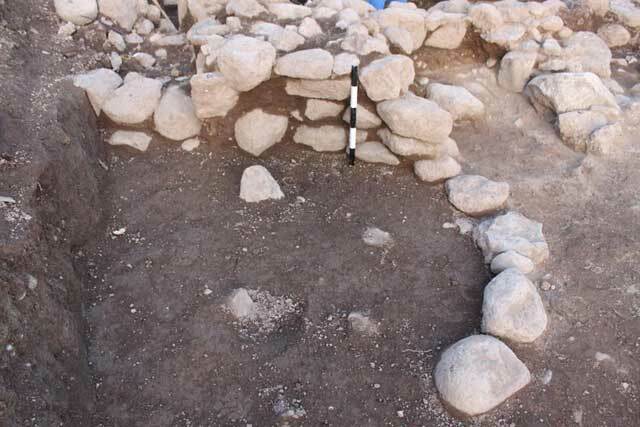 The excavation revealed remains of a settlement ascribed to the Early Iron Age and Mamluk period. 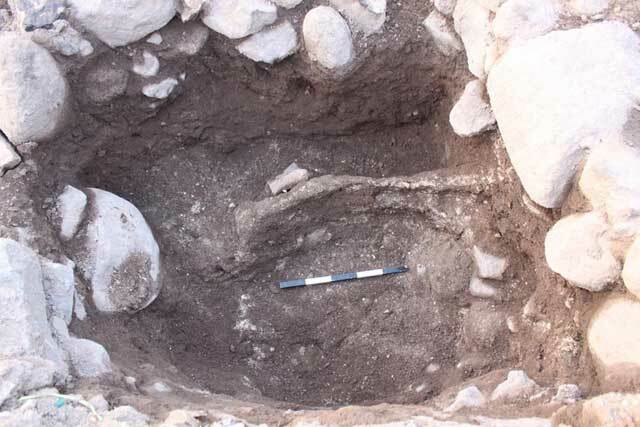 Prior to the excavation, no settlement remains earlier than the Hellenistic period were discovered in Kafr Misr. Hence the remains from Stratum III are the first indication that a permanent settlement of the Iron Age I was located at the site. Onn A. 1994. The Ancient Synagogue at Kafr Misr. ‘Atiqot 25:117–134. Syon D. 2006. Kafr Misr. HA-ESI 118. 3. Plaster Floor 106, looking east. 4. Installation 108, looking west. 6. Installation 109, looking east.